Studs, who wants a stud? K100-forum.com » Technical, repair and troubleshooting » Frame, fairing and wheels » Studs, who wants a stud? Now that the steel wholesalers are back after their break, I can, once again, try to organize some studs ( a la Rickmeister)...bolts into final drive, holds up the suspension. Seeing some people have changed their status....got more bikes.....I will call for names and numbers of studs and then with the final number I will get a quote for the making of. Me please Mister, just one. JR, I will try that, but will check the prices etc for the lot. One red, one pale green and one a colour of your choice. Or...how about I just get what I'm given. Just thought that considering where the stud is going to live that a gold passivated finish would be nice if possible thats all , not trying to be demanding ! 2 for me please colour is not important at all....but yet again a non threaded centre portion is atractive. I'll have one (1) please - any colour will do. Thanks heaps. Cheers Tom Grabau Newcastle. Studs have been ordered, sorry thread all the way, unfortunately as the cost of threading at two ends was too much. High tensile steel, about $7 a stud. Colour options available, as above.....no extra charge. Took my stud out (don't be rude) on the red bike so that the machinist could check out what is needed......slight bend in it! Perhaps now is a good time to change. I will pm people the week after next about arrangements. Am I too late for two Stan? Yes Rossco, I counted you in for one and I had one left over......just about a neat metre. Me too Please Stan..I shall have one. ainsjac wrote: Yes Rossco, I counted you in for one and I had one left over......just about a neat metre. I will fit one and carry the other ALA Rick should a friendly K driver bust his while on a trip I too can lend assistance. I really will have to look for a non personnel chair to carry all the parts and crap one "may need"
Hey Alby, if Ainsjac can't get you one, I'll sling you one of mine. @Klompy the grey brick wrote: I will fit one and carry the other ALA Rick should a friendly K driver bust his while on a trip I too can lend assistance. Don't bother...you'll just end up adopted by a dog who will sit in it and pontificate. Wow a religious dog how interesting. At 75mph on a quiet country road our mate Ullrich had the lower shock mount stud break. Quite spectacular to watch. If you weren't on the bike that is. ainsjac is having a bunch made up from some high tensile rod and we are replacing ours to hopefully prevent a similar thing. I personally know of 3 that have broken one on my wifes K75 and 2 K100s I have heard of many more. It seems to be more prevalent in Australia probably because of our crap roads but there have been some in USA as well. The stud is made of mild steel and just is not up to the job. What is needed is 8.8 tensile or in US terms Grade 5 steel but DO NOT use grade 8 it WILL break quite quickly. I have heard of them going at 20,000klm and not till 300,000klm. I can imagine that would leave an impression on a rider. 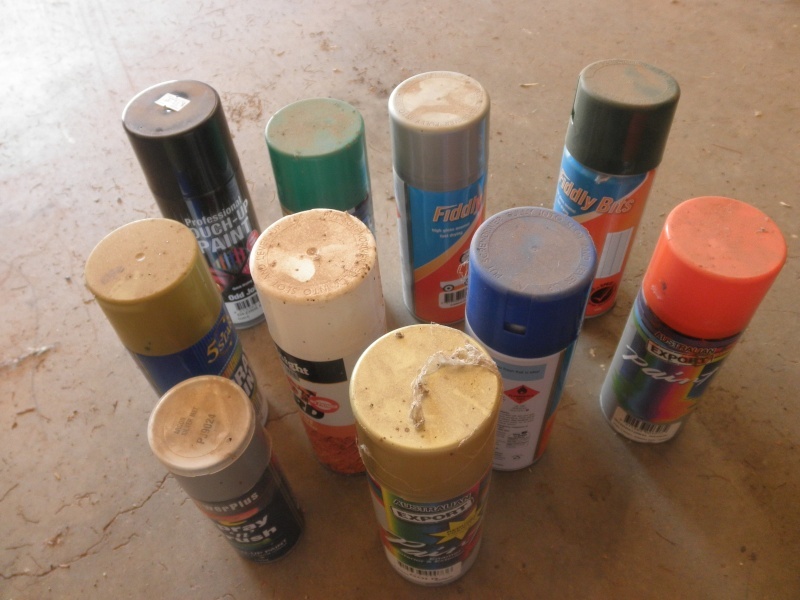 Just a matter of personal curiosity -- would these have rolled or cut threads? They are a rolled thread. The problem comes from a combination of a rubbermounted eye on the shock and a stud that just isnt quite up to the task. If you have a shock like an ohlins with a swivel eye on the bottom mount it probably will never break. 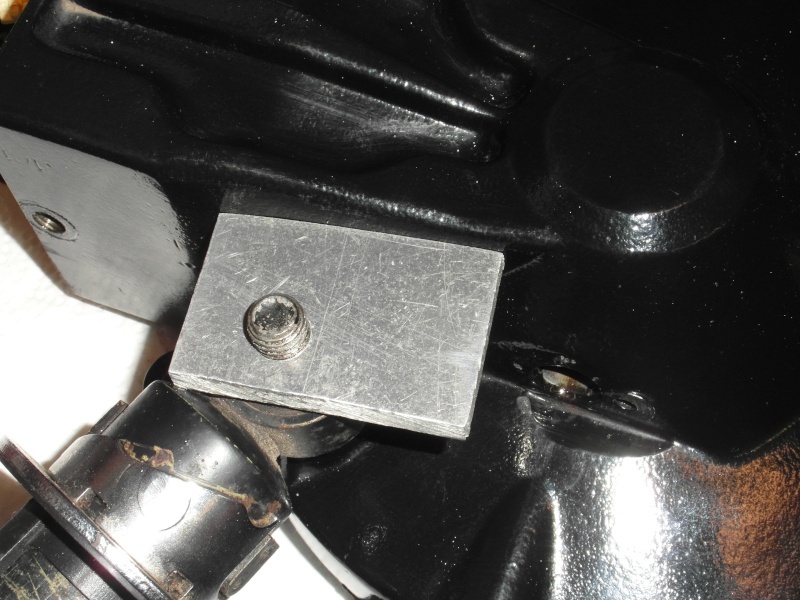 There were a couple of mods made one was to have a piece of 6mm steel under the nut that rested neatly on the case of the drive to support the stud as weight was put on it. The other was much the same but had an extra bolt hole at the front to pick up on the upper outer bolt holding the drive to swingarm. I could order another OEM stud. Would that be any better than what is on my 1985 K100RS now? I wouldn't know. In fact, I wouldn't even know if it was any newer, despite the advanced age of my bike. However, I suppose I can assume it has been less stressed in life, up to this point. Alternatively, I could visit the local specialty fastener house and buy an 8.8 grade M12x60 bolt and saw the head off. Any thoughts on the best course of action here greatly appreciated. The IKON shocker mine came with had a dodgy, knackered lower rubber bush. I lathed up a 2 piece bush with large diameter outer flanges, out of nylon bar stock. 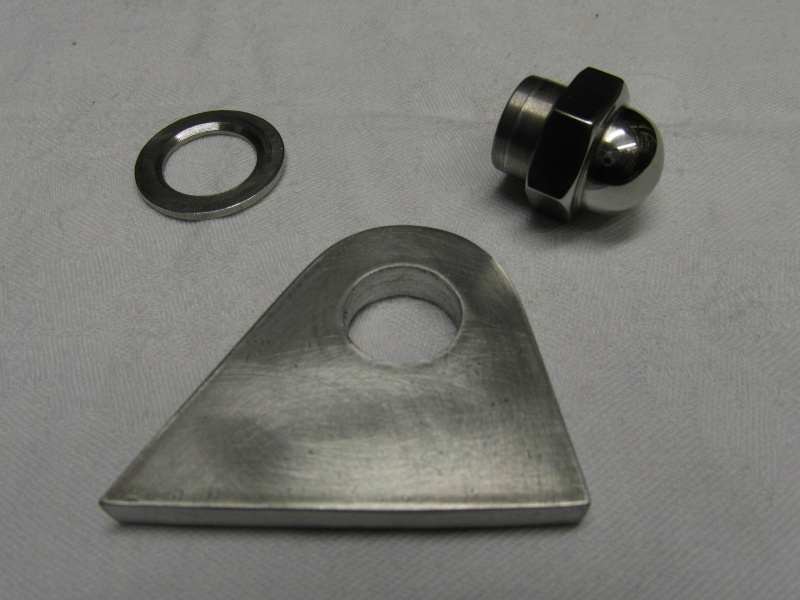 Add one large diam ss washer and a nyloc nut. I'm happy with it, no massive give like the rubber was obviously doing, has got to be easier on "Le Stud ". I would just go buy the 60mm 8.8 bolt. id rather have a bolt that bends with age and gives you an indication that something is wrong instead of sheering when you least expect it ....there is something to be said for "low tech "
Hmmm, now what shall I do tomorrow? I don't think I'll be riding! @Rick G wrote: If you have a shock like an ohlins with a swivel eye on the bottom mount it probably will never break. I've got a Fournales air shock on my K100rs. That has rose joints top and bottom. Why do these prevent the stud from failing. I can see that there would be no twisting or turning, but don't these studs fail on a sheer up and down fracture? Thanks Paul. I will have two things please. Time will tell. As soon as he sees the pictures of the thing he will make himself known. Don't let me down. I have seen your handy work. Half a one of your things is equal to at least 33/64 of one of my things. Let me know what postage is. 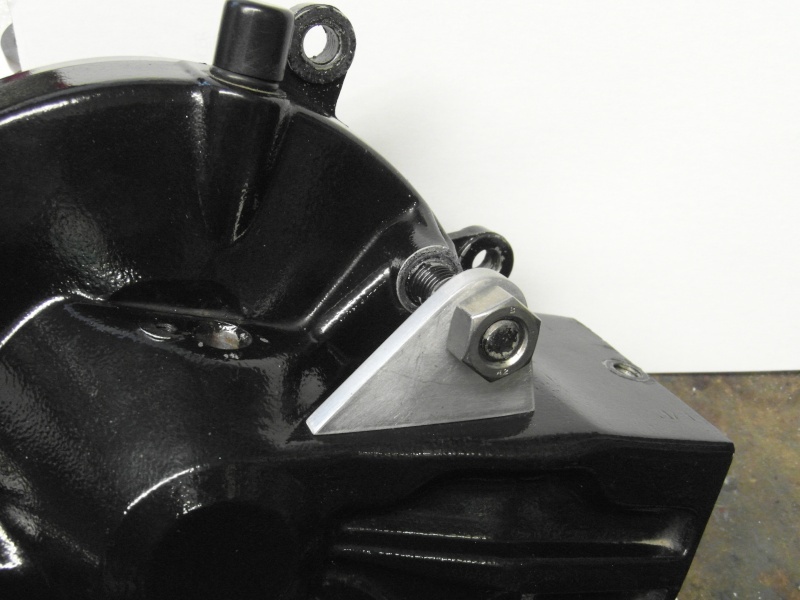 The inner globe is bolted tight to the bolt and prevents it from flexing which is what does the damage. I wont go so far as to say it would not break but that the chance of it happening would be something like 80% less. 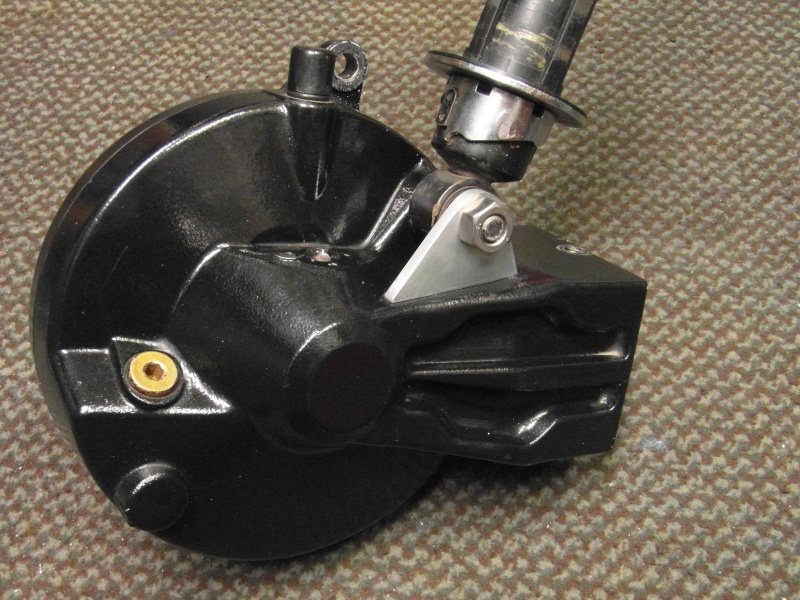 Having the globe bolted tight and not having rubber flexing is a heap stronger. How do you like the fournales, Good? I bought the fournales on a whim just wanting to try something other than the hagon shock that was on the bike when I bought it, knowing that I would get most of my investment back on resale if I didn't like it. Well its like a new bike, comfy, no bottoming out and seems to keep rubber to tarmac even on the nasty potholed tracks they call "B"roads here in rural Suffolk. OK here we go.This is what I've come up with. I figured that the greatest shock loads would be on 'bump' rather than 'rebound, so I made a block to support the stud just in that direction. Take a billet (it's a good word K-Bike!) of hard aluminium alloy 6mm thick x 40mm x 60mm. Drill a hole 26mm from the long edge and 20mm from the short edge. The stud has a 12mm thread, but mine has an O/D of 11.8mm so it is a good idea to make the hole a nice fit on the stud. Not having an 11.8mm drill, I drilled 7/16" and, using an adjustable reamer, opened the hole to the required 11.8. Now comes the fun bit, file the lower edge to match the profile of the bevel box housing. Unfortunately it's not a straight edge so it's a case of 'file a bit' 'try it', 'file a bit' 'try it' etc. Aim for as much contact between the block and bevel box as possible. The casting is also not parallel to the stud, it slopes, as one would expect, about 2 or 3 degrees. This is useful , because, with careful filing, we can get the support block to wedge tightly against the housing when the stud nut is tightened. Now, all that remains, is to cut and file to an asthetic profile. There you are, you don't need a lathe or milling machine (although I don't know how anyone can live without them), just a drill, hacksaw and file. An improvement would be to open the hole to, say, 14mm and make a new shouldered nut,............ but then you'd need a lathe. That is what I was trying to describe in the other thread in case someone had managed to picture something like a moon landing module. G'day Paul , looks good , would it be possible to weld the support to the FD housing then change the stud to a shouldered bolt through arrangement ? , or would the welding distort the case ? True, it could be welded, but I was thinking of something that anyone with a bit of metalworking ability could make and fit without pulling the bevel box apart. 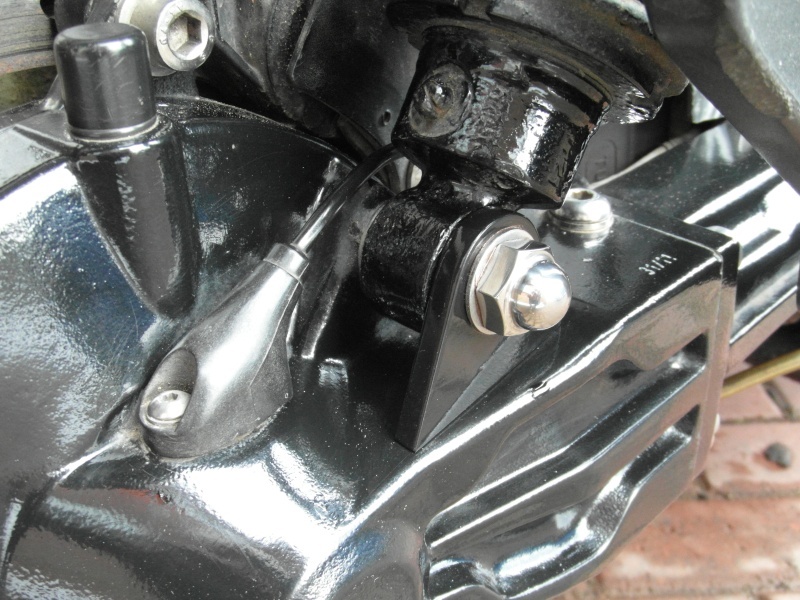 Because of the angle of the casting below the stud, careful filing, so that when fitted by hand there is still a gap between the support block and the damper bush, means that when the nut is tightened the block is wedged tightly against the stud and case. If you can achieve this then I can't see any advantage with welding. I'm tempted but then I'm not that heavy and don't take a pillion. If I miss most of the potholes reckon I should be OK! Who am I kidding. Now the seed of doubt is sown........... ! I know how you feel Dave. My studs are original...............but when Ulrick's stud broke last year, well, you start to wonder. I bought a bolt of the appropriate size this week. When the weather becomes reasonable again I'll cut it down and replace the stud with it. Cheap insurance for some peace of mind, I'd say. I made the 'new super improved' version today; that's the one with the big hole and shouldered nut. This will give a much greater surface area to support the stud and a longer thread engagement for the nut. Note the little refinement of the taper on the nut shoulder. This allows for the bracket to be put in position and as the taper starts the sleeve nut into the hole the few thou difference in diameter loads the block against the bevel housing. I'll put Mark 1 on the solo and version 2 will be fitted to the outfit once it has been painted black to match the painted bevel box. If anybody else tries this idea, please let us know, it would be nice to get some feedback. I installed the one for the outfit today..............thought "what if my stud breaks before I fit the support?" ......so I daren't go out 'till it was fitted! @sidecar paul wrote: I installed the one for the outfit today..............thought "what if my stud breaks before I fit the support?" ......so I daren't go out 'till it was fitted!Paul. Very pretty. When you take it off again just pop it in a post bag and send it to Rossco c/o Australia. They will find me. And what is that bolt/screw you have in the front of your final drive on the top just near the ratio stamp towards the left but closer to the edge than the centre? Rossco, that's the filler plug for my ill-fated rear spline oil bath. I may try it again one day. Have fun this weekend, I've just been googling Aussie maps to see where you are all heading. After being away for a week, all these new modifications..well done. Studs have arrived and I will pm people this coming week. @Klompy the grey brick wrote: 2 for me please colour is not important at all....but yet again a non threaded centre portion is atractive. I was wondering why BMW used an 'all thread' stud, because, as Klompy says, a plain centre section does seem to be atractive. 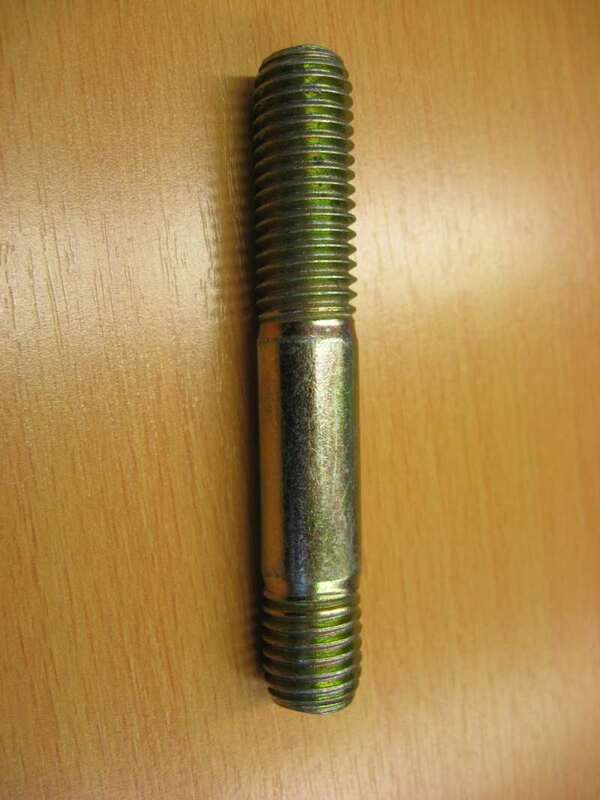 An 'all thread' stud has a constant root diameter, nom 10.2 mm. A stud with a plain section would have different diameters, ie, 10.2 root at the threads and 12 at the plain section. Now, any bending load on the 'all thread' stud would be spread along the whole stud, but on the variable diameter stud the load would be concentrated at the change of section. So perhaps the 'all thread' is less likely to fail?